YHJ600 Cuber-Perforator do meat cutting by two sets of multi taper tooth knife, to penetrate the meat surface with regular cubes and meat fiber. Available on former to produce beef patties. Penetration depth adjustable, knife penetration adjustment is uniform. Available on patties temperature with -4 ℃~10 ℃, portions less than 20mm thick. Removable upper and lower knife stripper assemblies. Using reliable safety protection device; Water proof grade reach to IP55. Using SIEMENS and other imported parts, reliable and safe. Applying 304 stainless steel with food standard, totally meet the HACCP requirement. Cubing knife: Sharp, thin, spaced for knitting and cubing. YHJ600 Cuber-Perforator (cuber perforator machine) do meat cutting by two sets of multi taper tooth knife, to penetrate the meat surface with regular cubes and meat fiber. 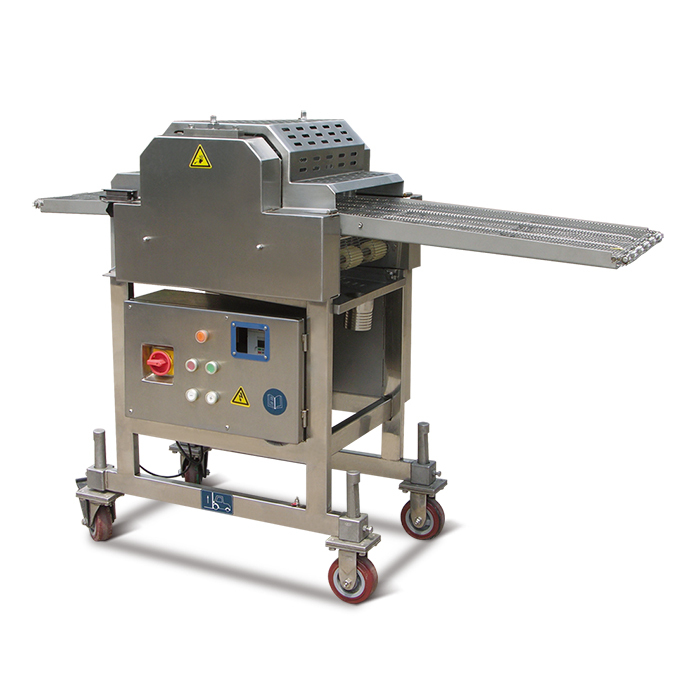 It will prevent product from contraction of meat by frying or roasting and shorten the frying time, speeds freezing. It can be applicable to tenderize for patties and other products.